It was a sunny day in Century City. I was there at the headquarters of the famous law firm O’Melveny & Myers to interview Warren Christopher for my documentary “Flying Man: Life and Times of Johnny Myers.” Warren Christopher is the former Secretary of State under President Bill Clinton, and a man who has dedicated his life to service. Warren Christopher knew Johnny Myers for many years. They both were members of the Sunset Club and both had worked for O’Melveny & Myers. Warren told me some great stories about Johnny Myers. Warren felt that Johnny Myers represented the Walter Mitty in every attorney because he lived such an adventurous life, even though he started as an attorney. Warren told me the history of the O’Melveny and Myers law firm. He told me about how Johnny Myers’ father was Supreme Court Justice in California who went partners with O’Melveny to create one of the nation’s most successful and prestigious law firms. Warren Christopher told me the story about how John Myers became the nation’s first entertainment attorney, representing many famous Hollywood actors including George Murphy and Bing Crosby. He talked about how Johnny’s passion for flying led him to become the Chief Test Pilot for Lockheed, then going over to Northrop for the P-61 and the Flying Wing. Johnny Myers was one of the only test pilots who worked for both Lockheed and Northrop at the same time. Warren talked about how he and Johnny Myers enjoyed great friendship and experiences as members of the Sunset Club. He talked about how Johnny Myers had such a contagious laugh. In the later years, Johnny Myers would still come by the office sometimes. One time John Myers did a slideshow of his flying exploits for the O’Melveny & Myers team. Warren talked about how even today new hire attorneys are told about the history of the firm, about the two founders and their values and integrity, and also about the fun and exciting adventures of Johnny Myers. Warren talked about the courage and character of his friend John Myers. Warren talked about how John Myers was a man with strong values, like his father. Warren talked about the sense of humor or John Myers. He told the story about John Myers was flying once with this very heavy set lawyer and they were flying from the East Coast to the West Coast. Evidently the plane was having trouble making it over the Rocky Mountains with such a heavy load, so John Myers dropped off the lawyer and had him take a train or bus to the other side of the Rockies where he picked him up and on they went on their journey. I really enjoyed meeting Warren Christopher and appreciate him taking the time to talk about John Myers. I drove up the windy road up to the top of the hill looking over Beverly Hills and to all of LA, to the home of John Gavin. I was there to interview John Gavin for my documentary “Flying Man: Life and Times of Johnny Myers.” John Gavin was a successful actor in Hollywood during the 50s and 60s, in movies like “Psycho” for Alfred Hitchcock. He also was a successful businessman and then became the Ambassador to Mexico under Ronald Reagan. John was also a good friend of Johnny Myers for over 25 years. John likes to be called “Jack” Gavin. 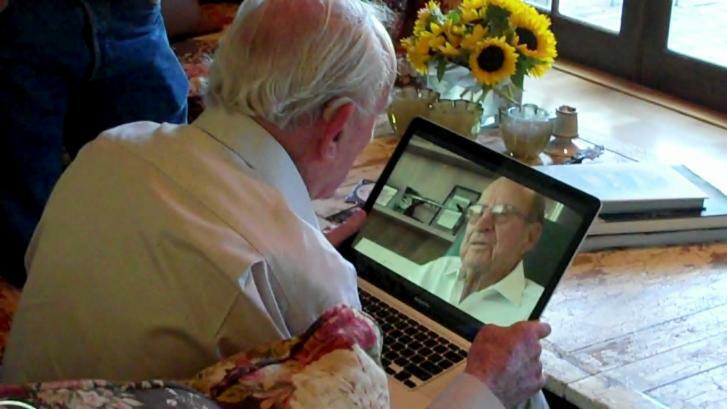 We sat together as I recorded on video his memories of his friendship with Johnny Myers. I could tell that Jack Gavin stilled misses Johnny Myers. Jack talked about how he met John Myers at the Sunset Club. Jack talked about the good times he had with Johnny Myers. He talked about their times at the Los Angeles Country Club and at the Bohemian Grove outings. Jack Gavin talked about John Myers the man. He told me that Johnny Myers was a wise man, a humble man, a man whom he admired very much. Jack talked about flying with Johnny Myers. He told a story about how Johnny Myers could do rolls with the aircraft without anyone ever spilling their drinks. He talked about the character of John Myers. Jack talked about Lucia Myers and how she was the first woman on the Bank of America Board of Directors. Jack talked about Johnny Myers’ sense of humor and how he used to call himself “skinhead” because of his balding hairline. Jack Gavin said it must have been contagious, pointing to his own hairline with a smile. 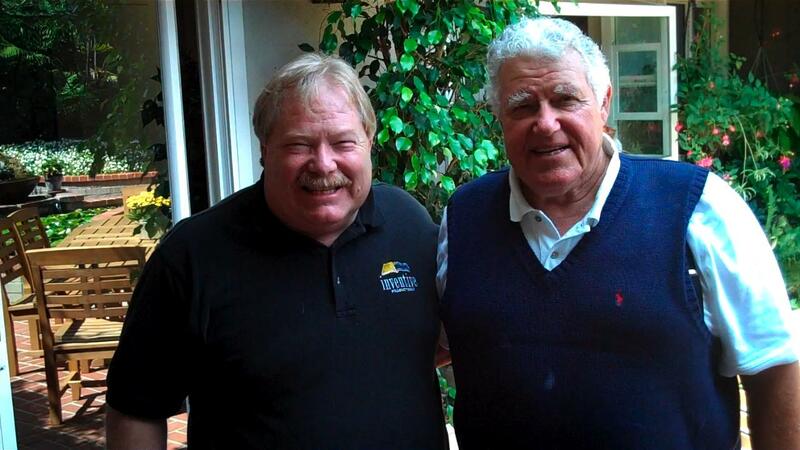 Jack was very nice in our interview and he did a great job in describing many excellent stories about John Myers. He talked about the great aviation stories that Johnny Myers would tell, only if asked. He said that Myers wasn’t the type of person who talked about the past unless you dragged it out of him. Jack Gavin talked about how kind Johnny Myers was to everyone and how he had great courage. Not the kind of courage one brags about. The humble kind of courage. I could tell that Jack Gavin had many fond memories of his experiences with John Myers. Thanks, Jack Gavin, for taking the time to talk about your friend, Johnny Myers. It was a beautiful day in Santa Monica. I was there to interview David Price for my documentary “Flying Man: Life and Times of Johnny Myers.” David Price is a very nice guy. I could tell that immediately. He came from very humble beginnings to become a very successful businessman, aviator, and spiritual inspiration to many people. 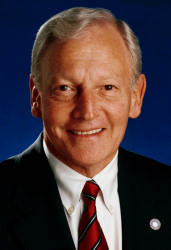 David Price is the CEO of American Airports, the largest developer and operator of airports in the country. He was the founder of American Golf Corp which managed over 300 golf courses. He also is the founder of a Christian school and the Museum of Flying in Santa Monica. During our interview, David was awesome. He showed me some airplane models all over his office. These were models of all the different planes he has flown. David’s eyes lit up when talking about each plane. As we toured his office, David showed me his diploma certificate when he graduated from UCLA law school, pictures of his time as an attorney for O’Melveny & Myers, and he was very proud of a bell from the USS Arizona from Pearl Harbor. As we sat down for the interview David reminisced about his friend John Myers. I couldn’t get the camera started fast enough. David was moved by him memories. We talked a bit about his own life. David really is a self-made man. He came from humble beginnings. He is the son of Welsh immigrants but did go to college studying economics at USC and then went to law school at UCLA. He was a US Navy pilot during the early 1950s. He missed the Korean War, but clocked in lots of flying time as flight instructor. He talked about his childhood in the Santa Monica area where Lockheed was building airplanes for the war. He remembered seeing all the pilots in their flight suits. This was where he probably got the bug for aviation. He remembered all the cool interesting airplanes he saw in his youth. David talked about his first solo flight in an airplane. That is a moment that most pilots will never forget. David talked about his love for airplanes, especially those planes from WWII. He owns a few now and tries to fly as much as possible. He talked about his flying in the Reno Air Races and about the tremendous friends he has met through aviation, including his friend General Bill Anders. 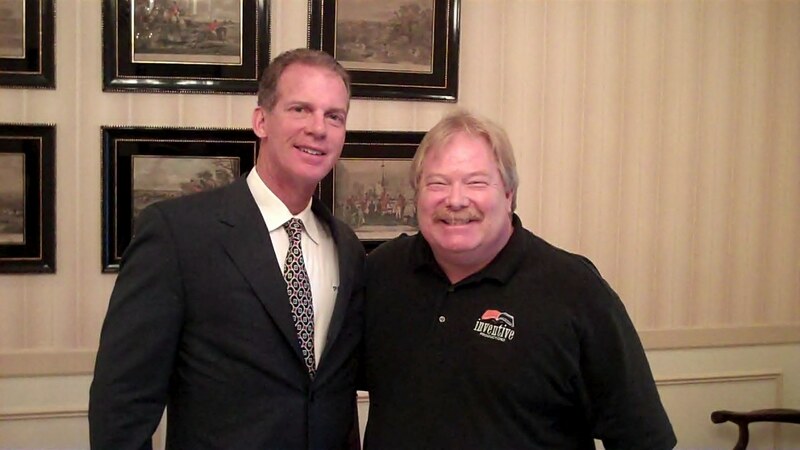 I asked David to talk about those days at O’Melveny & Myers, his first law firm experience. He talked about the incredible fundamental values he learned from those days. He said they were very professional, efficient, and extremely dedicated to honest day work ethic. Over the years David enjoyed working with many of the Hollywood celebrities who were clients of O’Melveny & Meyers. He told stories about working with movie stars like Marlon Brando and Bing Crosby. He talked about working with actor William Holden and negotiating the pay for his role in “Bridge Over the River Kwai.” David told about his blessings to have met and learned from some wonderful mentors over the years. He talked about a turning point in his life when he met Joseph Drown, a local businessman and real estate investor. He quit the law firm and went to work with Drown, which led him to leadership positions in several businesses like Getty Financial Corp, Beachcomber restaurants and the Bel Air Hotel. Then David went into the Golf business and the rest is history. During our interview, it was very interesting to me how David Price could recite Shakespeare and quotes from the Bible. We talked about John Myers and his being such a great friend to so many. We talked about how John Myers had so many friends that did not know each other. I mentioned this might be the best legacy a man could have, to have touched so many in so many different ways. David told me how he got to know John initially through John’s wife Lucia. Lucia was a remarkable woman in her own right. She was on the Board of Directors of Bank America for a long time. David talked about times with John Myers at the Sunset Club and at Bohemian Grove and at the LA Country Club. He talked about flying with John in his helicopter in Merced and about thier common love for aviation. I was very touched by my interview with David Price. He is a nice guy. He is a true lover of aviation. David Price a self-made man who reads the Bible, can recite Shakespeare, and loves to race WWII airplanes for fun. It was a warm day in Brentwood. I was driving to meet Peter Mullin, CEO of MullinTBG, to interview him for my documentary “Flying Man: Life and Times of Johnny Myers.” Peter is a great guy. He is a car lover. My dad was a car lover and I think I am a car lover, too. I saw a show on the SPEED channel last year that showed Peter Mullin and his car collection. Peter has one of the world’s greatest collections of French classic automobiles. From Bugatis to Delahayes, Peter has one. He is also a great race driver himself. Trophies and ribbons and placques are everywhere. Peter is a successful businessman, but I could tell the race car trophies mean a lot. Peter did an excellent job in the interview. We discussed his friendship with Johnny Myers. Peter talked about John’s integrity and his love for automobiles. He said that John used to come over and look under the hood of these incredible cars. Peter talked about the incredible character in the man John Myers. He said that he was a rare man indeed. I really enjoyed my time with Peter Mullin. He seemed like a good man. It is interesting to me how so many of the successful business people I am meeting all have a similar focus on the importance of values and character and integrity. I told Peter about how much my Dad loved Model A Fords and had restored many. Peter said, “they were a great car.” As I looked around at the incredible high end French classic cars, I thought how Model As would compete against such beauty and grace. Peter talked about how the French auto makers used aviation design to enhance the aerodynamics of these French automobiles so many years ago. As you look at the smooth lines of these cars you can see a lot of aviation in those cars. Maybe John Myers could see that too. It was a little bit smokey over in Pasadena this afternoon. There was a 120,000 acre fire up in the foothills. But it was pretty nice down in Pasadena. I was there to interview H. Russell Smith, former CEO of Avery Dennison and good friend of Johnny Myers for over 75 years. Russ had agreed to be interviewed for my new documentary “Flying Man: Life and Times of Johnny Myers.” Russ was originally from Ohio and his family settled into the Whittier area in the 1920s. Russ had some great stories about his youth and his family history. His family were Quaker farmers who raised Russ with tremendous values and integrity. Russ went to high school with Richard Nixon. Russ always had interest in economics and political science so he won a scholarship to Pomona College where he was the captain of the track team. After college Russ went to work for Kidder Peabody investment banking in New York City. This was in the middle of the Great Depression. He spent a year working in Switzerland during the late 1930s. Upon returning to the US, he worked for a year with Blue Diamond until the war started. He served in the US Navy during WWII. After the war he took a leadership role in Avery Adhesives (later Avery Dennison) where he rose to CEO. He first met John Myers through John’s lovely wife Lucia. Over the years John Myers and Russ Smith became close friends. They were in a lot of clubs together including the California Club and the very exclusive Sunset Club. Russ told me some great stories about his friendship with John Myers, including some of his fun flying adventures together. 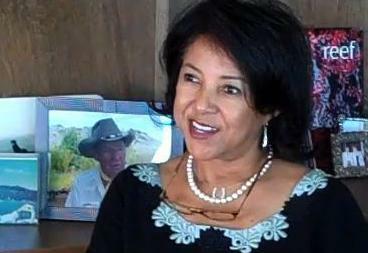 Russ talked about Lucia Myers and her terrific personality and wisdom. Russ did a fantastic interview and I really appreciate having the opportunity to meet him. Russ talked about how John Myers was a handshake type of man. I could see that Russ Smith was that type of man, too. Russ and I talked about family history and biography. He showed me two books he had written, one about his life and one about the letters he wrote to his mother throughout his life. Russ signed his autobiography book and gave it to me. I am grateful for his generosity. As I started reading his book I learned how many charities and important causes that Russ has helped over the years and the list is long. Pomona College. Childrens Hospital. Philharmonic. Psoriasis Research. The list goes on. Russ is an inspiring man in many ways. It was a warm day in Southern California. The news had headlines about the terrible fires all across the hilltops of the Ranchos Palos Verdes area where I was headed and I didn’t know what to expect. Luckily the fires had been mostly put out and the actual fires were about two miles over the hill from where I was going. I was there to interview Roy Wolford, the official photographer for Northrop during those incredible test pilot years when Johnny Myers was risking his life on first flights. Roy had worked over 60 years for Northrop. Hard to believe these days that anyone could work one place for so long. Over the years Roy had worn many hats in many departments. He was the first photographer for Jack Northrop when he was pioneering the Black Widow and Flying Wing technologies. Eventually Roy led a whole department of photographers with high tech still and motion picture cameras. We talked for a long time about the different kinds of cameras and equipment he used to capture the test flights. Then we talked about John Myers. Roy was a good friend with John Myers since Myers first day with Northrop. Roy talked about the character, will, and integrity of John Myers. He talked about the leadership skills John had when he eventually became the VP of Northrop. Then we talked about the crash. Roy was there that day that John Myers had a terrible crash that nearly killed him. Roy told me about how he ran up to the wreckage and he screamed to John several times, only to see Myers totally quiet. Roy feared the worst but he kept screaming to John and finally he saw John’s eye twitch some movement and Roy realized John was alive. This was a very emotional moment of the interview. Roy is a great guy. He talked about how he first learned to fly and how much he loved aviation. Roy showed me several books on Northrop history and a lot of the photos from the test pilot days. In one book he showed me tons of photos of John Myers and the test pilots. All the photos had a credit to Roy Wolford. In one photo it showed several of the pilots all together with Roy in his flight suit. Roy flew in the planes being tested and outside the planes and in front of the planes and behind the planes. Roy’s photos were a tremendous help to the engineers working to test these aircraft. In the early days, the test pilots would have a small notebooks taped to their legs so they could make notes during a flight. Roy had the idea that photos would really help the engineers learn what really was happening during those flights. He was right. Thanks to Roy we have lots of photos of those early test flights and early planes. Roy has donated all of his photos and materials to several museums in the area. I am hoping to get access to them there and also through Northrop, who has kindly donated access to their archives for this project. Roy and I hit it off. I enjoyed talking to Roy very much. He lived during some of the most fantastic times in Aviation history and he was right there. He talked about flying with John Myers in the P61 and about his meeting Howard Hughes. Roy’s wife of over 59 years died a few years ago and now Roy lives in a nice assisted living place. But I don’t think he’s ready for much assistance yet. We went out to lunch and Roy showed me where the Western Aviation Museum is located at Torrance. Roy talked about how at the age of 94 he still feels strong and wants to keep active. At his apartment he showed me boxes where he has over 30,000 slides. Through his work at Northrop he was able to travel all around the world, including time during the Vietnam War in Southeast Asia. All the time, in every continent of the world, Roy Wolford took photos. I kept asking him how he could hand hold a camera and get perfect focus on those test flights. He said he had a steady hand and good eyes. As a lover of photography myself, I was in awe of the incredible skills of Roy Wolford. Meeting him was a true joy. It was a warm and beautiful drive down to Corona Del Mar. I was there to interview Tad Devine for my documentary “The Flying Man: Life and Times of Johnny Myers.” Tad is a great guy. He is the oldest son of the famous actor Andy Devine and he knew Johnny Myers ever since he was a little kid. I have always been a fan of Andy Devine. He was in my favorite movie of all time, the John Ford and John Wayne film “Stagecoach.” Andy Devine had worked in Hollywood since the silent days, had tremendous success both in the movies and on television. He had a very successful television show for many years. Tad did a fantastic job in the interview. He told me some fantastic stories about his family history, how his mother’s family raised horses and his father’s family ran a hotel in Kingman, Arizona for many years. He talked about how his father came to Hollywood and got into the movies because of his football playing. Tad told me how his father got that unique voice that became his trademark. Then we talked about Johnny Myers. Tad had met Johnny Myers when he was very young. John Myers was one of the world’s first entertainment attorneys and had worked with many of the most famous movie stars in the 30s, including Bing Crosby and Andy Devine. Over the years John Myers became more famous as a flyer and a test pilot. But he kept in touch with his friends, including Tad Devine. Tad talked about how their friendship endured all the way until Johnny died in his 90s. I asked Tad if he could tell me stories of John Wayne, since John Wayne was always my number one hero. Tad told me some great stories about John Wayne and his memories of his dad. I could tell that Tad was very close to his father. I am very grateful that Tad took the time to let me interview him for my movie about Johnny Myers. It was a great experience. All you need to do is type in the words “Shelby Cobra” into youtube and you will see first hand the incredible Automotive classic cars that Carroll Shelby has designed and built ever since in the 60s. Cobras and Vipers and more. Carroll has been an aviator since the 1930s when he paid one dollar to fly in a bi-plane. During WWII Carroll was a training flight instructor for the US Army Air Corp. He has been flying all through out his career. 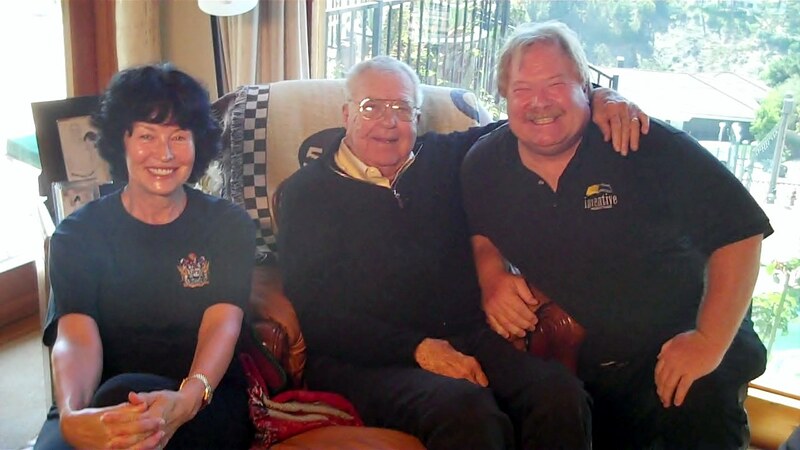 We were there to interview Carroll Shelby and his beautiful wife Cleo for our documentary “The Flying Man: Life and Times of Johnny Myers.” Carroll and Cleo have become great friends of Johnny Myers over the last dozen or so years. They had spent time with John up at his ranch in Merced, California and on several other trips, including one at the giant Oshkosh Aviation Celebration. Cleo told some great stories about how John Myers was very inspirational for her learning how to fly. John was a major influence to her. Carroll talked about his friendship with John Myers and how they really respected each other. 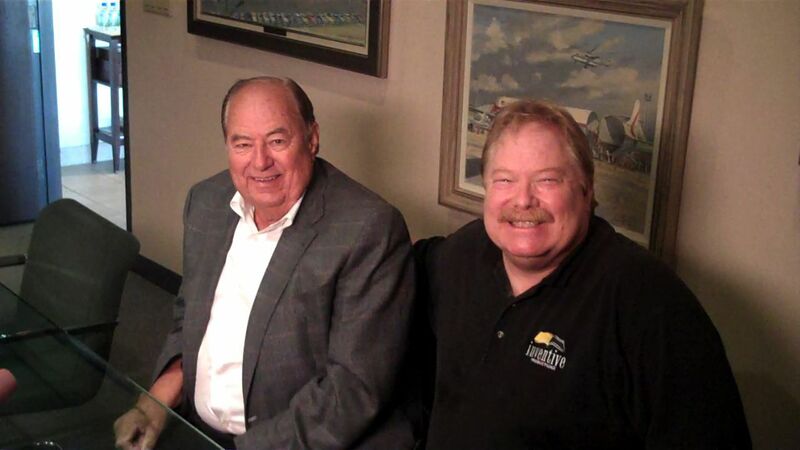 He said that John was so humble, that it took a lot to get John Myers to talk about his legendary flying skills. He talked about John Myers’ sense of humor and his always being a gentleman. 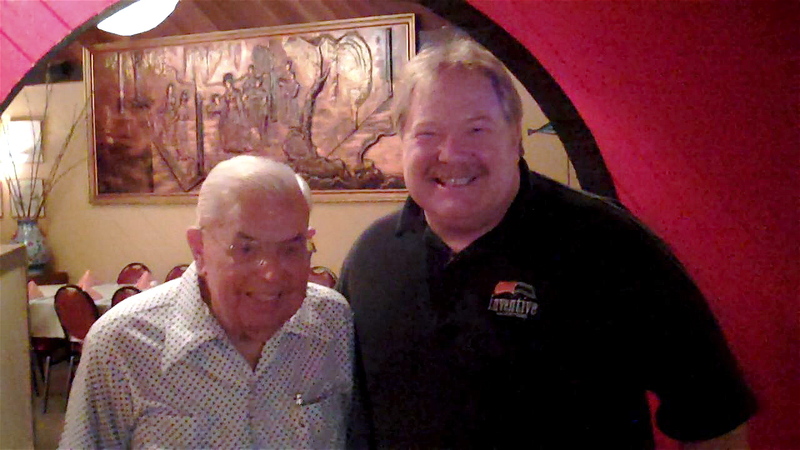 I really enjoyed meeting and interviewing Carroll Shelby and his wife Cleo. They both remind me about the importance of appreciation. Carroll talked about how he has some other man’s heart in his chest. He had a heart transplant many years ago. He said he was very appreciative of every moment he has on this earth. Cleo and Carroll talked about how they met. They are a great couple. Carroll told me so awesome stories about his relationship with his father. How his father had encouraged him to go for his dreams. The message for me is to try to be a better “encourager” to others and to be more “appreciative” of life. Thank you Cleo and Carroll Shelby for a fantastic time together. Tom Jones was very clear. He did not want to talk about anything where he wasn’t actually there. Tom said that he would be happy to talk about John Myers because he was a “Friend for Life.” Tom Jones has led a very interesting life, including many years as CEO of Northrop Grumman. But today we were there to interview Tom about his good friend Johnny Myers for our new documentary “The Flying Man–The Life and Times of Johnny Myers.” I was hoping that Tom would be able to give us some insight into Johnny Myers’ years working for Northrop. But it is easy to forget that Johnny Myers lived to be way over 90 years old. Tom really didn’t want to talk about those days. He wanted to talk about John Myers, the man. Tom said that he couldn’t pinpoint the first time he met John Myers because he seemed that they had lived their whole life as friends. John and Tom were in many clubs and organizations together. We talked about how John used to go to the Country Club a lot but that he did not play golf. John wanted to see his friends. Tom talked about how much John loved his wife Lucia. He said that Lucia was a beautiful and wonderful wife to John Myers. Tom told me some great stories about John Myers and how he was truly a remarkable human being. Tom said that John Myers was a gentleman, a person with impecable integrity and strong will. Tom said that John Myers was the kind of man you looked up to, someone who always had a great attitude about life and was always looking for ways to help others. I could tell that Tom Jone was a life-long friend of John Myers and that they both had some common traits – including kindness and respect for others. I really enjoyed my interview with Tom Jones. He is a real nice man. Eric Rhoads is a lucky guy. He was hired to be the personal jet and helicopter pilot for the legendary aviator and businessman Johnny Myers. We drove down to Redondo Beach to meet with Eric for our new documentary “The Flying Man” about the Life and Times of Johnny Myers. Eric sat down and started grinning as he remembered “Myers” as he called him. Eric first met John Myers about three years before he died, when Eric was hired to be his pilot. Over the years they became good friends. Eric said that his life was changed for the better because of the wisdom and character and integrity he learned from John Myers. Eric said that “Myers” was a “hand-shake” type of a guy. Someone who was bigger than life, someone who once he became your friend, you could count on being a friend for life. Eric talked about John’s love for the outdoors and for his dog Gus. He told great stories about flying with John Myers and Gus. He said that John Myers might not be well known in the general population community, but that among the pilot friends he knew, John Myers was a true to life hero. Eric said that everywhere he went, he saw how people lit up with enthusiasm when they met John Myers. Eric said that John was well respected among people all around the world. 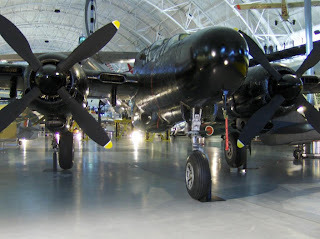 Eric talked about when he flew with John to the Smithsonian Institute in Washington D.C. when they introduced the P-61 Black Widow Night Fighter that John Myers was the original test pilot. He talked about the man he was fortunate to call friend. Eric talked about his many tripw with John Myers up to the Flying M Ranch in Merced, where John ran a real cattle ranch. He said that John Myers loved cattle and ranching. 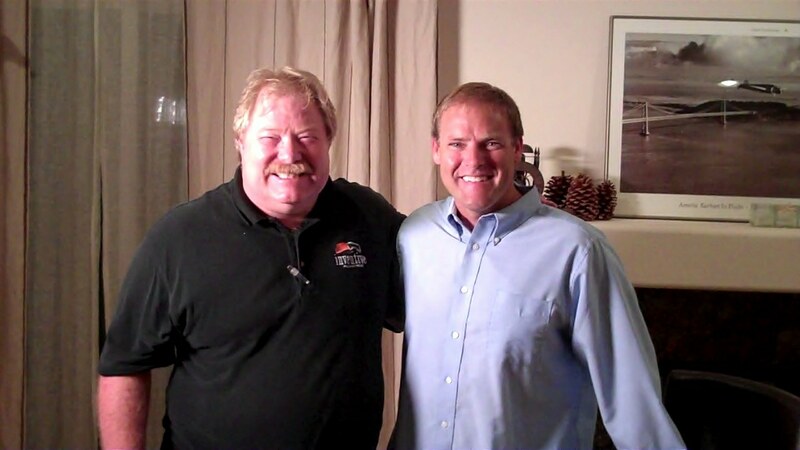 We talked about John Myers love for boating up at Big Bear and his joy for driving fast cars. Overall Eric kept talking about the wisdom and integrity and character of John Myers. He talked about the good friendships that John Myers had built up over a lifetime well into his 90s. He talked about the last time John Myers flew a helicopter and how thrilling it was to see the master fly it perfectly. I could tell that Eric enjoyed his time with John Myers and that he would never forget the lessons he learned from that tall man with the dog. Over fifteen years ago, Peter Allen became good friends with Lou Myers and his father John. They did a lot of outdoors adventures together. When Lou Myers passed away, it was only natural that Peter Allen would become even closer to John Myers. We met Peter Allen at the California Club in downtown Los Angeles. The California Club has tremendous history and it was a big part of John Myers life. He had a lot of friends there. We were there to interview Peter Allen for our new documentary “The Flying Man” about the Life and Times of Johnny Myers. Peter told us some great stories about John Myers and about his great wisdom and positive outlook on life. John Myers had a genuine charisma about him. People always liked John Myers because he was a gentle giant of a man. Someone with humility, with kindness, with a great instinct about people. Peter Allen told us about some of his great trips with John Myers over the years. About John’s love for his dog Gus, and for aviation. Peter was the last person to see John alive. I really appreciate the hospitality and generosity Peter gave to us during our interview. We drove to Southern California to interview Paul Thayer about his friend Johnny Myers for our documentary “The Flying Man.” Paul is a great guy. He sat down with me and we talked about how he met Johnny Myers. Paul was a Fighter Pilot during World War II. He served in the North Africa campaign and then was quickly sent over to Guadacanal. After the war Paul worked at an airline where he met his wife Margery. Paul eventually got a job as an insurance sales man. Then one day Margery saw an advertisement that a company was looking for Test Pilots. Over 1800 people applied for the job but Paul Thayer got the job. That is where Paul met John Myers. Thayer worked under John at Northrop. Paul talked about how great a man Johnny Myers was. He said that Myers was a man of integrity. Paul told me some great stories about how he and Johnny Myers flew a P-61 Black Widow one time. He talked about how John Myers nearly died during the testing period of the Flying Wing. Paul told some great stories about how he and Johnny Myers and Jack Northrop worked together. 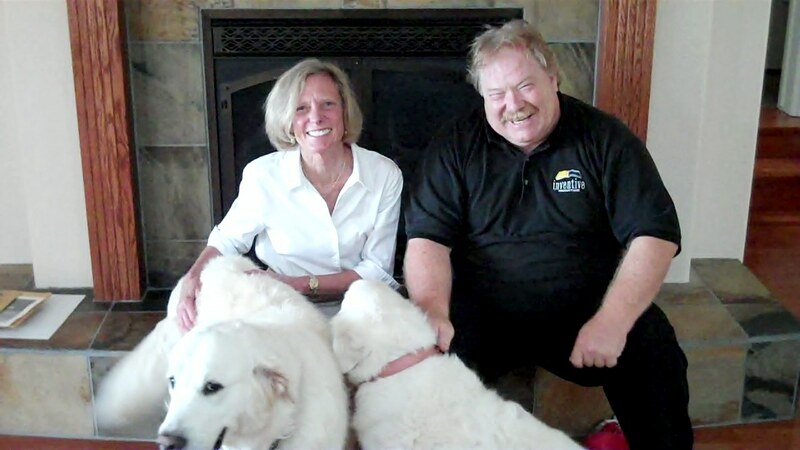 We talked about how in later years John Myers became a successful businessman. He talked about some of the clubs they both belonged to over the years. Paul told me how much John loved his wife Lucia and how painful it was to lose Lucia. Everytime our discussion went to stories of flying, Paul’s eyes would light up. I could tell that Paul loved aviation. He talked about Johnny Myers love for fast cars and fast boats. He also talked about John’s love for his dogs. I was really impressed by my interview with Paul Thayer. He is a very nice man. I have learned that Paul once was Under-Secretary of Defense under Ronald Reagan. I asked him about Ronald Reagan. He said that Reagan and John Myers were similar in many ways. I asked him if Johnny Myers was a good guy. He said that he was more than a good guy. He was a remarkable man. Thank you, Paul Thayer, for letting me interview you for our documentary. The GPS on my cell phone said to turn right and go up the hill. The road was narrowing and very windy all the way up to the top and the view became incredible. We were on our way to meet Bill Tilley, one of the last people to see Johnny Myers before he died. I would say that Bill Tilley is a Rennasance man. His home is like a castle with a remarkable view. When we arrived, Bill led us to a large room he calls the "Museum" because of all the interesting displays on all the walls. As we set up our cameras and lights and sound equipment we were mesmerized by numerous heads of big game trophies including bears, elk, big horn sheep, and more, way more. Bill Tilley gave me a terrific interview. He talked about his enduring friendship with Johnny Myers. He looked up to Johnny Myers, not only because Johnny Myers was a tall man, but because he was a great man. Bill Tilley told me some incredible stories of the special moments he had experienced with Mr. Myers over the years. He told me the stories that Johnny had told him about when he knew Howard Hughes, the time Johnny Myers saved the life of Charles Lindbergh, and intriguing tales of Johnny's test pilot days. Bill also was able to tell me a little about Johnny Myers business career after the war and his philosophies about people. He told me that Johnny Myers really cared for other people. Bill told me about how Johnny Myers was totally in love with his wife Lucia and how they were such a wonderful couple. 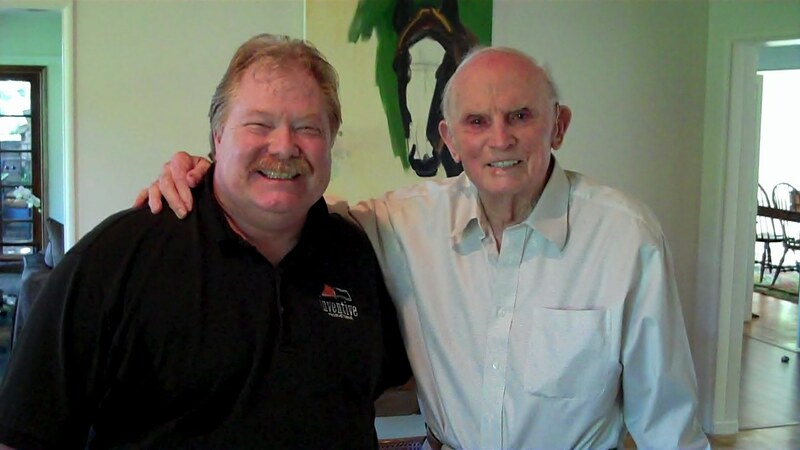 Thanks, Bill Tilley, for taking the time to discuss your friendship with Johnny Myers. 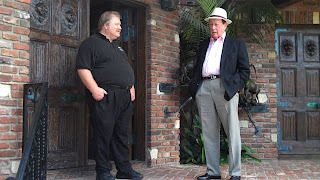 I drove down to Southern California to do several interviews for my documentary, “The Flying Man: Life and Times of Johnny Myers.” I first met Clay Lacy last December when I interviewed him for a short video we made for the “Legends of Aviation” celebration. That time Clay was very kind to me, driving me around his hangars and showing me some of his collection of very cool airplanes. Clay Lacy is considered as one of the greatest aviators of all time. I have been told several times by several people that Clay has the most hours as a pilot among living aviators. Some say he has over 50,000 hours, some say its over 70,o00. Everyone agrees that Clay Lacy is a nice guy. 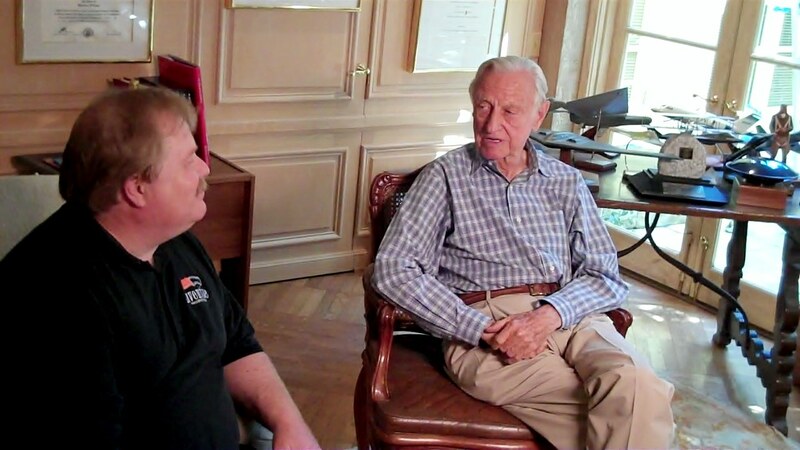 During our interview, Clay told some wonderful tales about his longtime friendship with Johnny Myers. He talked about how Johnny Myers saved Charles Lindbergh’s life. He told me about the days when Johnny Myers was the courageous test pilot of the P-61 Black Widow Night Fighter and the innovative but super dangerous Flying Wing. The best stories from Clay Lacy came when he talked about how much Johnny Myers meant to him as a good friend. Over the years they had so many wonderful times together. Clay talked about the qualities of character and integrity that came natural to Johnny Myers. In the end, I am so grateful for having been able to meet and interview Clay Lacy. He is the man who worked with Bill Lear and the aviator who did a lot of the aerial photography for big movies like “Top Gun” and “The Right Stuff.” Clay talked about how pilots are honest people. The more pilots I meet and interview, the more I begin to understand what he means. Men like Clay Lacy are the type of man we look up to and the type of man we need more of. Heroic, courageous, living life to the fullest. Thank you, Clay Lacy, for your generosity. I would love to do your video biography some day. Janice Merriweather worked for Johnny Myers for over 26 years. We drove down to the Long Beach Airport to the former office of Johnny Myers to interview Janice for our new documentary “The Flying Man” about the life and times of Johnny Myers. John Myers was a legendary test pilot who did “First Flight” testing on the famous Black Widow P-61 and the Flying Wing. In later years Myers was a successful businessman in the aviation industry. Janice showed us John Myers’ office which has the best view of an airport I have ever seen. As you walk into his office you can see a fantastic array of models of several different kinds of airplanes from WWII to jets. Janice told us that John Myers these were some of the aircraft that Mr. Myers flew in his career. Janice did a wonderful interview, telling fantastic stories about her years working with Mr. Myers. She told me about the integrity and character of Mr. Myers. He was a rare person. A man with values. We really appreciate Janice Merriweather’s help with our documentary. General John R. Dailey — Director at the Smithsonian Institute – National Air & Space Museum. I drove up to Washington DC from Baltimore. It was raining in Baltimore, but the sun was shining in DC. There must be something huge happening in DC because there are kids and buses everywhere. I circled around until my GPS took me to the entrance of the National Air & Space Museum at the Smithsonian Institute. I was there to interview the Director of the Museum, General John R. Dailey, for my new documentary “The Flying Man” about the legendary test pilot Johnny Myers. Johnny Myers once was a board member at the Smithsonian and General Dailey had become a close friend of Johnny. My interview with General Dailey went very well. He talked about the wisdom and character of Johnny Myers and how each had a unique view on aviation history. Johnny Myers was a test pilot, and John Dailey was a four star general, a Marine pilot with over 6000 hours of flying experience including fighter planes and helicopters. General Dailey had flown over 400 combat missions in Vietnam. He earned numerous awards, including the Bronze Star, Distinguished Flying Cross, and Vietnam Gallantry Cross. After Vietnam, Dailey continued his dedication to his country by working his way up to General. He also worked in the top leader positions at NASA and the Marine Command. Now John Dailey is the Director of the Smithsonian Institute’s National Air & Space Museum. I was really moved and impressed by my interview with John. He is truly a nice guy, and he gave me a great interview about Johnny Myers. I would like to return soon to interview General Dailey about his own personal life story. When you meet some of these heroic people, its sometimes hard to believe that this person did all these incredible achievements. It makes you realize that we are all people and that anyone can be a hero if they dedicate themselves to others. I learned a lot in my short interview with General John Dailey. I asked myself what can I do to serve others and sacrifice for others, the way General Dailey has done his entire life. I arrived at Clay Lacy Aviation about fifteen minutes early. I had woken up at 8am, thought it was enough time to prepare for a 10am meeting. I started reading an article on my laptop about Clay Lacy’s life and the next thing I knew it was 9am and I hadn’t even taken a shower yet. I rushed and it all worked out.Lacy Aviation is located right at the Van Nuys Airport. I parked in visitor parking and then walked to the front door. It was a beautiful sunny California day. Just yesterday I was in the storms of frigid cold Seattle, but here today I was in Sunny Southern California, 75 degrees, tee shirts and shorts everywhere. I asked the receptionist for a blank piece of white paper that I could use to set my “white balance” on my High Definition camera. I used it for the white balance and also to write down the main subjects that I wanted to discuss. I set up the lights and camera and angled it all so a nice model of a jet would be right behind the subject’s right shoulder. Clay Lacy came in wearing a brown suit with a tie. Clay is a big man with lots of wrinkles from a a good life. We shook hands and he asked, “So, what’s this all about?” I told him I was a professional video biographer who has been hired to shoot videos for the Legends of Aviation event to be held in Beverly Hills in January. I told him that if Airport Journals likes the videos we might go back and do video interviews with all the previous 7 years recipients, including himself, who was a true Legend of Aviation. I talked to Clay about my pro-bono work with the Veterans History Project and my goal to interview 100 World War II veterans. We sat down an the interview began. I asked Clay to talk about the legendary aviator Johnny Myers. Clay talked for a good length of time about Johnny Myers, and then he talked about other legends including Bob Hoover, Linden Blue, and Sidney Pollock the film director. 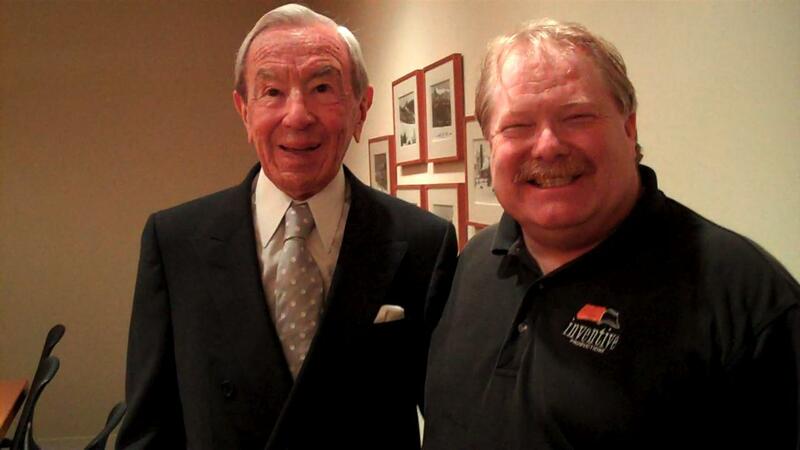 We talked about Milt Kuolt for a while and then we talked about the difference between a pilot and an aviator. Clay loaded us into his white Lexus SUV and we drove around the air hangars for about an hour. I was able to record a lot of great footage and Clay telling great stories about each plane. He showed me several different kinds of planes including a Citation, a P-51, and lots more. Along the way we talked about his dad and his mentors and his life. We talked about his 52000 hours logged as a pilot, and some of the changes he has seen in his life. We returned to his office and he showed me his incredible wall of photos from the movies (including TOP GUN) he has shot and the planes he has flown. There were pictures of Clay with lots of movie stars including Danny Kaye and Frank Sinatra. Clay said I should shoot an interview with a guy named “B-27 Ben” who flew 35 missions over Tokyo during World War II. Clay said he would call me with Ben’s phone number. We shook hands and I grabbed my equipment. As I was leaving I saw Clay was busy with one of his employees, so I gave him a salute goodbye. I really enjoyed my short visit with Clay Lacy. A real nice guy. I drove over to Dulles International Airport to see the Steven F. Udvar-Hazy Center, a new part of the Smithsonian Institute’s National Air & Space Museum. The Center was named for its major donor, Steven Udvar-Hazy. I was there to get some pictures and video footage of the famous “Black Widow P-61″ and the “Flying Wing.” Both of these aircraft were first flown by test pilot Johnny Myers years ago for Northrop. I am producing and directing a new documentary about the life and times of the great aviator Johnny Myers. Johnny Myers was a mentor to so many pilots. He passed away last year. The P-61 was the first aircraft to primarily use radar and to fly at night during WWII. It was used at both the Battle of the Bulge and at Guadacanal. 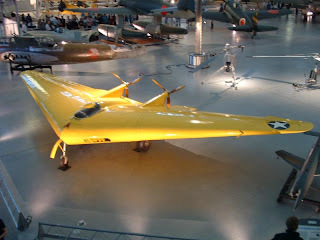 The Flying Wing was really the early prototype for what eventually became the stealth bombers. Johnny Myers was the test pilot for the Flying Wings at Northrop. Thanks to everyone at the Steven F. Udvar-Hazy Center for their hospitality.